New York - A small plane carrying New York Yankee Cory Lidle slammed into a 50-story skyscraper Wednesday, apparently killing the pitcher and a second person in a crash that rained flaming debris onto the sidewalks and briefly raised fears of another terrorist attack. 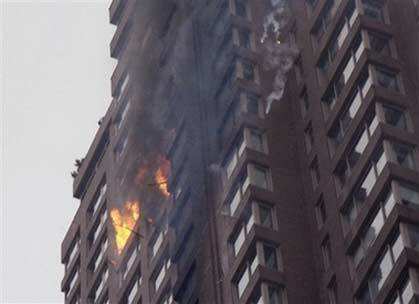 A law enforcement official in Washington said Lidle, an avid pilot who got his license during last year's offseason, was aboard the single-engine aircraft when it issued a distress signal and plowed into the 30th and 31st floors of the high-rise on Manhattan's Upper East Side. Mayor Michael Bloomberg said both people aboard were killed. Lidle's passport was found on the street, according to a federal official, speaking on condition of anonymity. It was not immediately clear who was at the controls and who was the second person aboard. Federal Aviation Administration records showed the plane was registered to Lidle, who had repeatedly assured reporters in recent weeks that flying was safe and that the Yankees, who were traumatized in 1979 when catcher Thurman Munson was killed in the crash of a plane he was piloting, had no reason to worry. "The flying?" the 34-year-old Lidle, who had a home near Los Angeles, told The Philadelphia Inquirer this summer. "I'm not worried about it. I'm safe up there. I feel very comfortable with my abilities flying an airplane." The crash came just four days after the Yankees' embarrassingly quick elimination from the playoffs, during which Lidle had been relegated to the bullpen. In recent days, Lidle had taken abuse from fans on sports talk radio for saying the team was unprepared. "This is a terrible and shocking tragedy that has stunned the entire Yankees organization," Yankees owner George Steinbrenner said in a statement. He offered his condolences to Lidle's wife, Melanie, and 6-year-old son. The federal official said the plane had issued a distress call before the crash. The craft took off from New Jersey's Teterboro Airport about 2:30 pm and was in the air for barely 15 minutes, authorities said. Bloomberg said Lidle and his flying companion were sightseeing and were taking a route that took them over the Statue of Liberty, the Brooklyn Bridge and the Empire State Building. The FAA said it was too early to determine what might have caused the crash. The National Transportation Safety Board sent investigators. How the plane managed to penetrate airspace over one of the most densely packed sections of New York City was not clear. The plane was unusual in that it was equipped with a parachute in case of engine failure, but there was no sign the chute was used. The crash rattled New Yorkers' nerves five years after the Sept. 11 attacks, but the FBI and the Homeland Security quickly said there was no evidence it was anything but an accident. Nevertheless, within 10 minutes of the crash, fighter jets were sent aloft over several cities, including New York, Washington, Detroit, Los Angeles and Seattle, Pentagon officials said. The plane, flying north over the East River, along the usual flight corridor, came through a hazy, cloudy sky and hit The Belaire, a red-brick tower overlooking the river, with a loud bang. It touched off a raging fire that cast a pillar of black smoke over the city and sent flames shooting from four windows on two adjoining floors. Firefighters put the blaze out in less than an hour. At least 21 people were taken to the hospital, most of them firefighters. Their conditions were not disclosed. Large crowds gathered in the street in the largely wealthy New York neighborhood, with many people in tears and some trying to reach loved ones by cell phone. "It wasn't until I was halfway home that I started shaking. The whole memory of an airplane flying into a building and across the street from your home. It's a little too close to home," Sara Green, 40, who lives across the street from The Belaire. "It crossed my mind that it was something bigger or the start of something bigger."